Subscribe to International Journal of Therapy and Rehabilitation Magazine. 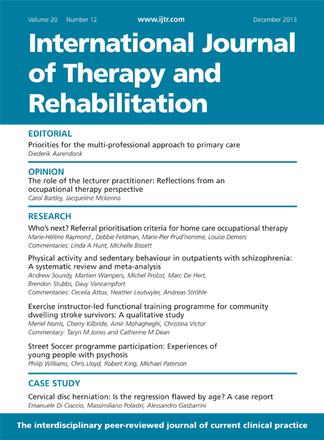 International Journal of Therapy and Rehabilitation is the only interdisciplinary review journal for occupational therapists, physiotherapists, speech and language therapists, nurses and other allied health professionals working in therapy and rehabilitation. It publishes original research and clinical reviews, written by experts and peer reviewed by leading international authorities to ensure that the journal is accessible, relevant and useful in daily practice. Subscribe to International Journal of Therapy and Rehabilitation today and benefit from Peer reviewed clinical practice, education and original research articles covering a wide range of topics to ensure that the journal is relevant to all allied health professionals Commentaries published alongside articles to encourage further thought and analysis In depth reviews of the evidence on a particular area of therapy and rehabilitation Narrative, evidenced based articles discussing important developments and issues in therapy and rehabilitation practice Articles with a more personal and sometimes controversial opinion on current issues affecting allied health professionals Case reports focusing on interesting cases, and often highlighting novel approaches to interdisciplinary working International Journal of Therapy and Rehabilitation will help ensure that you have all the information you need to develop your career and provide the best possible care to your clients. The journal contains interdisciplinary content and strong international focus encouraging collaboration and the sharing of new ideas, to help practitioners enhance their knowledge and skills in a variety of fields and settings.. International Journal of Therapy and Rehabilitation Magazine subscription.